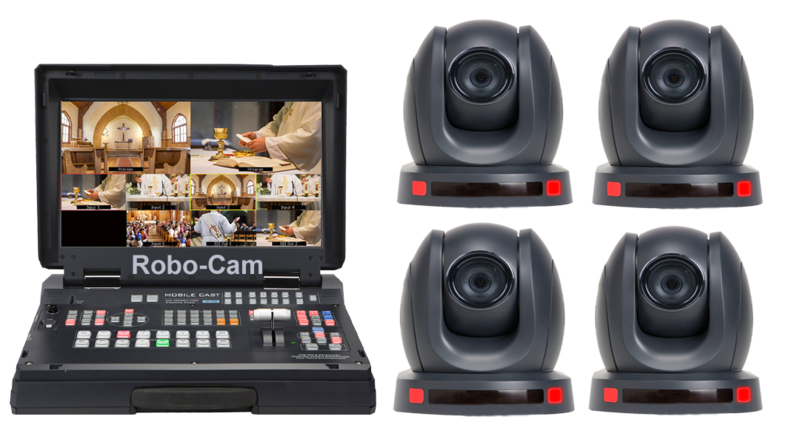 Live Stream your wonderful occasion with robotic low profile HD cameras. Note: If you are looking for the traditional documentary wedding videos which are produced and edited with pre and post production involving editing, special effects and music, etc, for weddings or quinceañera or Bar Mitzvahs, etc. then this is not what you’re looking for. There are plenty of services that provide that service. What we Do is telecast the wedding as it plays out. Live Stream it, or both. Once the ceremony is over, the video ends. We can have multiple PTZ cameras set up for you so that we don’t miss a shot. If conditions allow, we can even get a camera mounted outside to get the bride and groom exit. These cameras are full HD, controlled remotely to reduce production distractions and recorded on HDD HD record deck. Visit our Equipment Page for more specs on our gear. There would be about a 4 hour set up and a 1.5 hr tear down and strike. If you need footage of the reception after the ceremony you would need to book a separate videographer to capture those moments as all we would be handling is just the ceremony itself. An example of our Wedding Production layout. Obviously, the camera layouts can vary and Taylor fit to the scenario at hand. The only concessions we would need is room for a 6’X30″ table, and access to power. For sound logistics, we can take in house audio from an existing PA or soundboard. If necessary we can also mic up the bride, groom and matrimonial officiator. We can also set up a boom mic to pick up general wild sound in the church if no soundboard is present. A 4-hour load in and set up time is preferred. We’d love to visit during rehearsals if allowed to plan the setup. Video can be delivered to you within 24 hrs via Dropbox, or a USB flash drive can be shipped to you. Call us for a meeting on the details. We’d be glad to provide this unique service for you. For other cities please call us, and we can discuss our options.